Drop forging saves on material usage and carries an upfront tooling investment that’s not nearly as expensive as you may think. Drop forgings are available in a wide range of ferrous and non-ferrous materials ranging from standard carbon & alloys steels, duplex, super duplex, nickel super alloys and other non-ferrous alloys. Size ranges from as little as a few grams up to many tonnes. In the closed die drop forging process, metal bar or billet is heated before being placed in the die then hammered until the metal completely fills the die cavity. During this process of plastic deformation, the material’s grain structure becomes compressed and aligned to the component shape which imparts greatly increased directional ­­strength with reduced stress concentrations in corners and fillets. Components manufactured this way are stronger than their equivalent machined-from-solid or cast parts. Forging a component greatly reduces the possibility of metallurgical defects such as porosity or alloy segregation as found in some castings. This leads to reduced scrap, a uniform response to heat treatment and predictable component performance in the field. There is virtually no possibility of porosity being introduced during the forging process. Even this can be checked with a low cost ultrasonic test after manufacture. The possibility of small surface cracks can be managed with a simple crack detection procedure towards the end of the process. Parts can be machined post forging with no loss of quality, because there are no voids or porosity in the fished article. Forging is often combined with machining for improved dimensional accuracy. This can also be achieved by post forge coining or sizing. Moving from machined-from-solid to forged components generates a saving in raw material usage. Starting from a near-net-shape forging can also reduce machining times. This means companies moving from machine-from-solid to machine-from-forging can generate enough capacity on their existing plant to save capital outlay on new machinery, as their business grows. Customers often assume that the initial tool cost required for near net shaped forging is prohibitive. In fact, forging dies and tools are quite simple in construction and are relatively low cost, making them viable even for jobs with low production quantities. This cost can be further mitigated by amortisation into the component piece price and even reclaiming preused die materials. Closed die forging tools typically last between 5000 and 7000 cycles in more common carbon materials but can be as low as 100 cycles where very complex shapes are required in high-strength super-alloys. Die life expectancies are greatly reduced by sharp corners, material forge-ability and very close tolerances. Some of these limitations can be offset by incorporating multiple impressions into the die design or by pre-forming the metal billet before putting it into the dies. Forging cycle times are rapid: a typical forging is often complete within 10-30 seconds. However some complex shapes require complex procedures where the level of skill and experience of the Stamper plays a key part. This process is suitable for low volume production as well as one-offs. This is because it produces parts with superior strength to weight properties that cannot be manufactured in any other way. Small volumes can be machined from solid, but they will have to compensate for reduced strength brought about by random grain alignment. Undercuts are not possible in forging, however, it is possible to form undercuts and form joints with secondary forging operations. These processes can be used to make a huge range of component sizes and geometries. Designing for forging must take into account a number of factors including partition line, draft angles, ribs, radii and fillets. Parts are formed by hammering, or pressing, which can produce surprisingly deep protrusions, up to 6 times the thickness of material. Draft angles can be minimised and even eliminated by clever design, especially in ductile materials like aluminium and brass. Radii, however, are very important because they encourage the flow of metal and reduce tool wear. Minimum radius increases with depth of protrusion. Most ferrous metals can be forged, including carbon, alloy, super alloy and stainless steels. Non-ferrous metals including aluminium, brass, copper and titanium are also suitable. A Forge is a relatively dangerous process to work and health and safety is maintained by operator training, controlled production procedures and involvement of the workforce. Noise and vibration can be managed with up to date damping under the hammer unit and the correct building structure. The forging process provides optimum use of materials with little waste. All trimmed flash and off cuts are recycled and of course all metal components can be recycled at the end of their life-cycle. 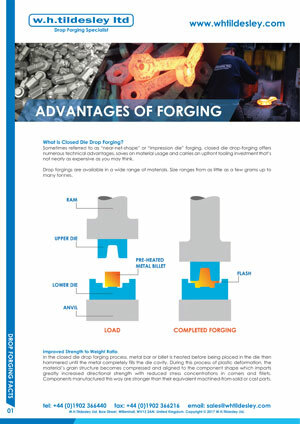 Please download our data sheet regarding the advantages of the drop forging process.